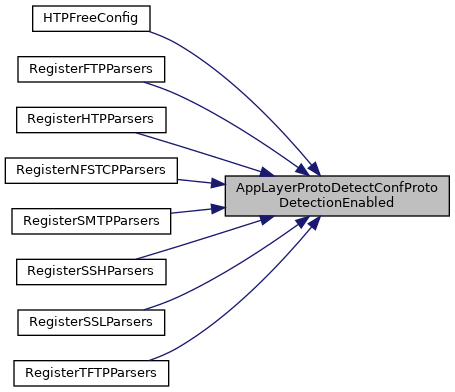 The app layer protocol detection context. 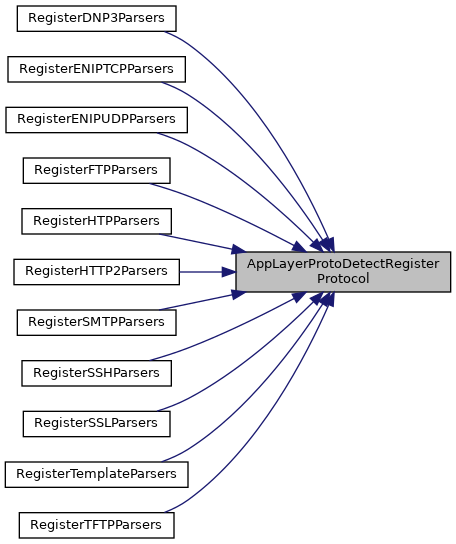 alproto Name of the app layer protocol. Definition at line 1883 of file app-layer-detect-proto.c. References BUG_ON, ConfGetNode(), ConfValIsFalse(), ConfValIsTrue(), RunmodeIsUnittests(), SC_ERR_FATAL, SCEnter, SCLogDebug, SCLogError, SCReturnInt, and ConfNode_::val. Referenced by AppLayerParserRegisterProtocolParsers(), HTPFreeConfig(), RegisterDCERPCParsers(), RegisterDCERPCUDPParsers(), RegisterDNP3Parsers(), RegisterENIPTCPParsers(), RegisterENIPUDPParsers(), RegisterFTPParsers(), RegisterHTPParsers(), RegisterModbusParsers(), RegisterNFSTCPParsers(), RegisterNFSUDPParsers(), RegisterSMBParsers(), RegisterSMTPParsers(), RegisterSSHParsers(), RegisterSSLParsers(), RegisterTemplateParsers(), and RegisterTFTPParsers(). Cleans up the app layer protocol detection phase. Definition at line 1789 of file app-layer-detect-proto.c. References AppLayerProtoDetectCtx_::ctx_ipp, AppLayerProtoDetectCtxIpproto_::ctx_pm, AppLayerProtoDetectCtx_::ctx_pp, MpmTableElmt_::DestroyCtx, FLOW_PROTO_DEFAULT, AppLayerProtoDetectPMCtx_::map, AppLayerProtoDetectPMCtx_::max_sig_id, AppLayerProtoDetectPMCtx_::mpm_ctx, mpm_table, MpmCtx_::mpm_type, PatIntId, SCEnter, SCFree, SCReturnInt, AppLayerProtoDetectCtx_::spm_global_thread_ctx, and SpmDestroyGlobalThreadCtx(). Referenced by AppLayerDeSetup(), and AppLayerProtoDetectUnittestCtxRestore(). Destroys the app layer protocol detection thread context. tctx Pointer to the app layer protocol detection thread context. Definition at line 2005 of file app-layer-detect-proto.c. References AppLayerProtoDetectCtx_::ctx_ipp, AppLayerProtoDetectCtxIpproto_::ctx_pm, MpmTableElmt_::DestroyThreadCtx, FLOW_PROTO_DEFAULT, AppLayerProtoDetectPMCtx_::mpm_ctx, mpm_table, AppLayerProtoDetectThreadCtx_::mpm_tctx, MpmCtx_::mpm_type, AppLayerProtoDetectThreadCtx_::pmq, PmqFree(), SCEnter, SCFree, SCReturn, AppLayerProtoDetectThreadCtx_::spm_thread_ctx, and SpmDestroyThreadCtx(). Referenced by AppLayerDestroyCtxThread(), AppLayerProtoDetectGetCtxThread(), and AppLayerProtoDetectUnittestCtxRestore(). Inits and returns an app layer protocol detection thread context. 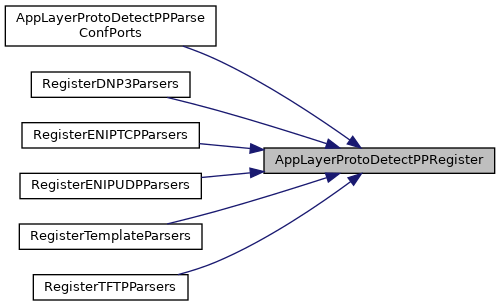 ctx Pointer to the app layer protocol detection context. Pointer to the thread context, on success; NULL, on failure. Definition at line 1951 of file app-layer-detect-proto.c. References AppLayerProtoDetectDestroyCtxThread(), AppLayerProtoDetectCtx_::ctx_ipp, AppLayerProtoDetectCtxIpproto_::ctx_pm, FLOW_PROTO_DEFAULT, MpmTableElmt_::InitThreadCtx, AppLayerProtoDetectPMCtx_::max_pat_id, AppLayerProtoDetectPMCtx_::mpm_ctx, mpm_table, AppLayerProtoDetectThreadCtx_::mpm_tctx, MpmCtx_::mpm_type, PatIntId, AppLayerProtoDetectThreadCtx_::pmq, PmqSetup(), SCEnter, SCMalloc, SCReturnPtr, AppLayerProtoDetectCtx_::spm_global_thread_ctx, AppLayerProtoDetectThreadCtx_::spm_thread_ctx, and SpmMakeThreadCtx(). Referenced by AppLayerGetCtxThread(), and AppLayerProtoDetectUnittestCtxRestore(). Returns the app layer protocol given a buffer. f Pointer to the flow. buf The buffer to be inspected. buflen The length of the above buffer. direction The direction bitfield - STREAM_TOSERVER/STREAM_TOCLIENT. Definition at line 1484 of file app-layer-detect-proto.c. References AppLayerProtoDetectProbingParserElement_::alproto, ALPROTO_DCERPC, ALPROTO_MAX, ALPROTO_UNKNOWN, FLOW_IS_PE_DONE, FLOW_IS_PM_DONE, FLOW_IS_PP_DONE, AppLayerProtoDetectProbingParser_::next, SCEnter, SCLogDebug, SCReturn, SCReturnUInt, and STREAM_TOCLIENT. Referenced by AppLayerHandleUdp(), and AppLayerIncTxCounter(). Definition at line 2042 of file app-layer-detect-proto.c. References ALPROTO_MAX, AppLayerProtoDetectCtx_::alproto_names, ALPROTO_UNKNOWN, SCEnter, SCMemcmp, and SCReturnCT. Definition at line 2059 of file app-layer-detect-proto.c. Definition at line 1743 of file app-layer-detect-proto.c. Definition at line 1716 of file app-layer-detect-proto.c. Referenced by AppLayerParserRegisterProtocolParsers(), AppLayerProtoDetectUnittestCtxRestore(), DCERPCCleanup(), and SSLVersionToString(). Definition at line 1729 of file app-layer-detect-proto.c. Definition at line 1638 of file app-layer-detect-proto.c. References AppLayerProtoDetectPPRegister(), ConfGetNode(), ConfNodeLookupChild(), SC_ERR_FATAL, SCEnter, SCLogDebug, SCLogError, SCReturnInt, STREAM_TOCLIENT, and ConfNode_::val. Referenced by AppLayerRegisterProtocolDetection(), RegisterDNP3Parsers(), RegisterENIPTCPParsers(), RegisterENIPUDPParsers(), RegisterModbusParsers(), RegisterNFSTCPParsers(), RegisterNFSUDPParsers(), RegisterSMBParsers(), RegisterSSLParsers(), RegisterTemplateParsers(), and RegisterTFTPParsers(). Definition at line 1604 of file app-layer-detect-proto.c. References AppLayerProtoDetectCtx_::ctx_pp, DetectPortCleanupList(), DetectPortParse(), head, DetectPort_::next, DetectPort_::port, DetectPort_::port2, SCEnter, and SCReturn. Referenced by AppLayerProtoDetectPPParseConfPorts(), AppLayerRegisterProtocolDetection(), RegisterDNP3Parsers(), RegisterENIPTCPParsers(), RegisterENIPUDPParsers(), RegisterModbusParsers(), RegisterNFSTCPParsers(), RegisterNFSUDPParsers(), RegisterSMBParsers(), RegisterSSLParsers(), RegisterTemplateParsers(), and RegisterTFTPParsers(). Prepares the internal state for protocol detection. This needs to be called once all the patterns and probing parser ports have been registered. Definition at line 1560 of file app-layer-detect-proto.c. References AppLayerProtoDetectCtx_::ctx_ipp, AppLayerProtoDetectCtxIpproto_::ctx_pm, AppLayerProtoDetectCtx_::ctx_pp, FLOW_PROTO_DEFAULT, AppLayerProtoDetectPMCtx_::max_sig_id, SCEnter, SCLogDebugEnabled(), and SCReturnInt. Referenced by AppLayerProtoDetectUnittestCtxRestore(), and AppLayerSetup(). This is the first function to be called after calling the setup function, AppLayerProtoDetectSetup(), before calling any other app layer functions, AppLayerParser or AppLayerProtoDetect, alike. With this function you are associating/registering a string that can be used by users to write rules, i.e. you register the http protocol for protocol detection using AppLayerProtoDetectRegisterProtocol(ctx, ALPROTO_HTTP, "http"), following which you can write rules like - alert http any any -> any any (sid:1;) which basically matches on the HTTP protocol. alproto_str The string to associate with the above "alproto". Please send a static string that won't be destroyed post making this call, since this function won't create a copy of the received argument. 0 On success; -1 On failure. Definition at line 1819 of file app-layer-detect-proto.c. References AppLayerProtoDetectProbingParserElement_::alproto, AppLayerProtoDetectCtx_::alproto_names, SCEnter, and SCReturn. Referenced by AppLayerParserRegisterProtocolParsers(), AppLayerRegisterProtocolDetection(), RegisterDCERPCParsers(), RegisterDCERPCUDPParsers(), RegisterDNP3Parsers(), RegisterENIPTCPParsers(), RegisterENIPUDPParsers(), RegisterFTPParsers(), RegisterHTPParsers(), RegisterModbusParsers(), RegisterNFSTCPParsers(), RegisterNFSUDPParsers(), RegisterSMBParsers(), RegisterSMTPParsers(), RegisterSSHParsers(), RegisterSSLParsers(), RegisterTemplateParsers(), and RegisterTFTPParsers(). Reset proto detect for flow. Definition at line 1863 of file app-layer-detect-proto.c. References Flow_::alparser, Flow_::alproto, Flow_::alproto_tc, Flow_::alproto_ts, ALPROTO_UNKNOWN, Flow_::alstate, AppLayerParserStateCleanup(), FLOW_RESET_PE_DONE, FLOW_RESET_PM_DONE, FLOW_RESET_PP_DONE, FlowUnsetChangeProtoFlag(), Flow_::probing_parser_toclient_alproto_masks, Flow_::probing_parser_toserver_alproto_masks, and STREAM_TOCLIENT. The first function to be called. This initializes a global protocol detection context. Definition at line 1758 of file app-layer-detect-proto.c. References AppLayerExpectationSetup(), AppLayerProtoDetectCtx_::ctx_ipp, AppLayerProtoDetectCtxIpproto_::ctx_pm, FLOW_PROTO_DEFAULT, AppLayerProtoDetectPMCtx_::mpm_ctx, MpmInitCtx(), PatternMatchDefaultMatcher(), SC_ERR_FATAL, SCEnter, SCLogError, SCReturnInt, SinglePatternMatchDefaultMatcher(), AppLayerProtoDetectCtx_::spm_global_thread_ctx, and SpmInitGlobalThreadCtx(). Referenced by AppLayerProtoDetectUnittestCtxRestore(), AppLayerSetup(), and RegisterAllModules(). Definition at line 2064 of file app-layer-detect-proto.c. References AppLayerProtoDetectProbingParserElement_::alproto, ALPROTO_MAX, AppLayerProtoDetectCtx_::alproto_names, SCEnter, and SCReturn. Referenced by AppLayerListSupportedProtocols(), AppLayerRegisterThreadCounters(), and AppLayerSetupCounters(). Definition at line 2031 of file app-layer-detect-proto.c. Referenced by SigMatchList2DataArray(), and SigMatchListSMBelongsTo(). Backs up the internal context used by the app layer proto detection module. Definition at line 2112 of file app-layer-detect-proto.c. Restores back the internal context used by the app layer proto detection module, that was previously backed up by calling AppLayerProtoDetectUnittestCtxBackup(). Definition at line 2120 of file app-layer-detect-proto.c. References AppLayerProtoDetectPMSignature_::alproto, ALPROTO_DCERPC, ALPROTO_FTP, ALPROTO_HTTP, ALPROTO_MAX, ALPROTO_SMB, AppLayerProtoDetectDeSetup(), AppLayerProtoDetectDestroyCtxThread(), AppLayerProtoDetectGetCtxThread(), AppLayerProtoDetectPMRegisterPatternCS(), AppLayerProtoDetectPrepareState(), AppLayerProtoDetectSetup(), AppLayerProtoDetectUnittestCtxBackup(), AppLayerProtoDetectUnittestCtxRestore(), AppLayerProtoDetectPMSignature_::cd, AppLayerProtoDetectCtx_::ctx_ipp, AppLayerProtoDetectCtxIpproto_::ctx_pm, FAIL_IF, FAIL_IF_NULL, FLOW_PROTO_TCP, FLOW_PROTO_UDP, FlowGetProtoMapping(), AppLayerProtoDetectPMCtx_::head, DetectContentData_::id, AppLayerProtoDetectPMCtx_::map, AppLayerProtoDetectPMCtx_::max_pat_id, AppLayerProtoDetectPMSignature_::next, PASS, Flow_::protomap, SCEnter, SCReturn, and STREAM_TOCLIENT. Register unittests for app layer proto detection module. Definition at line 3614 of file app-layer-detect-proto.c. Definition at line 2093 of file app-layer-detect-proto.c. References AppLayerProtoDetectProbingParserElement_::alproto, proto, SC_ERR_NOT_SUPPORTED, and SCLogError. request applayer to wrap up this protocol and rerun protocol detection. When this is called, the old session is reset unconditionally. A 'detect/log' flush packet is generated for both direction before the reset, so allow for final detection and logging. dp destination port to use in protocol detection. Set to 443 for start tls, set to the HTTP uri port for CONNECT and set to 0 to not use it. expect_proto expected protocol. AppLayer event will be set if detected protocol differs from this. Definition at line 1843 of file app-layer-detect-proto.c. References Flow_::alproto_expect, FlowSetChangeProtoFlag(), and Flow_::protodetect_dp. Referenced by AppLayerRequestProtocolTLSUpgrade(), and HTPFreeConfig(). request applayer to wrap up this protocol and rerun protocol detection with expectation of TLS. Used by STARTTLS. Sets detection port to 443 to make port based TLS detection work for SMTP, FTP etc as well. Definition at line 1858 of file app-layer-detect-proto.c. Definition at line 2080 of file app-layer-detect-proto.c.